COSMIC FORTUNE™ 5 Jackpots in 1 game ! With COSMIC FORTUNE™ the gambler finds himself propelled into the future. He embarks on a quest through space for a MEGA progressive jackpot which may earn him up to £100,000 (on average). This video slot game begins with a short animation film which is only a few seconds long and may be skipped at any moment, featuring monsters coming from space in an attempt to invade and destroy earth. A courageous human decides to challenge them, jumping into a spaceship, chasing them one by one. The pixelated design and the unique colour used in this short animated movie bring to mind the first video games, it is then replaced by the modern and colourful design of the NetEnt video slot. 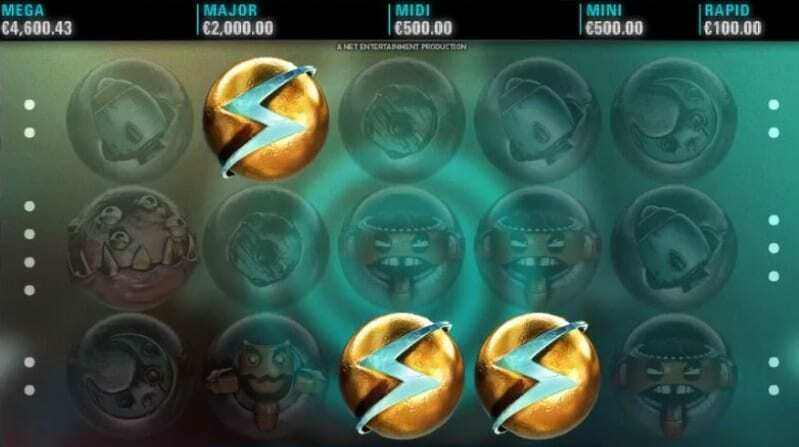 In the main game and the Free Spins, the symbols appear on planets which illuminate when a winning combination is obtained on one of 15 bet lines. 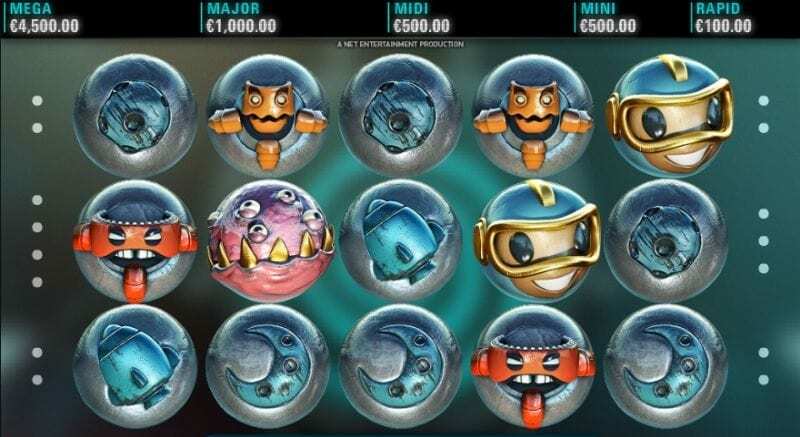 All the symbols revolve around the theme of space: planets, the moon, rockets, monsters from another galaxy and even the friendly hero who hides an imposing mass of blue curls under his space helmet, and has for mission to protect the planet and to offer gamblers a chance to hit big wins and 5 different jackpots! The Wild symbol is a planet marked with a golden W. The Scatter Symbol, which activates the Free Spins Feature is easily identified, representing a planet covered in gold. 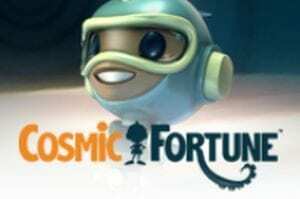 Although it is inspired by the first video games on various levels (information on the wins and the entertaining animations featured in the bonus game for example) COSMIC FORTUNE™ is a modern online slot which will delight the most pernickety of gamblers. The slot provider has attached great importance to the design of the Free Falls Bonus Game, during which marbles are thrown from a spaceship. Every one of them represents an opportunity for the gambler to earn additional coins and win one of the 5 jackpots at stake since yes, COSMIC FORTUNE™ brings into play 5 different jackpots (2 fixed and 3 progressive). Launched in 2014, this game is one of the best online slots developed by NetEnt. COSMIC FORTUNE™ is a 5 reel mobile slot with 3 rows and 15 lines which operate with an Avalanche Feature™ slot engine. This way, the symbols do not spin on the reels, but they pile up on one another. Moreover, every time 3 identical symbols or more appear from left to right on a bet line, forming a winning combination, the machine pays and the winning symbols disappear. The remaining symbols stack on top of each other and new ones appear from the top. The mechanism repeats itself as long as there are winning combos. In the main game, the highest payout value symbol represents the hero of the game with his helmet, and it may offer a chance of hitting a big win, since a bet line featuring 5 of these symbols pays 1500 coins (multiplied by the bet level and the coin level). The Wild symbols featured in this game may act as a substitute for every symbol, apart from the Scatter symbol. They may only make an appearance on the 2nd and 4th reel. COSMIC FORTUNE™ displays a total RTP of 96.90%, and is set at 53.70% in the main game. COSMIC FORTUNE™ owes its popularity amongst gamblers to its special features which offer a chance of winning 5 jackpots, of which 3 are progressive jackpots. When a player obtains 3 Scatter symbols anywhere on the reels, he triggers 10 Free Spins called the Free Falls. During these Free Falls, each and every Scatter symbol which appears anywhere on the machine grants 5 additional Free Spins. If when 3 Scatter symbols appear on the screen the machine also happens to display other winning combinations, it will pay the winnings and will activate the Avalanche Feature™. The Free spins will only be activated once it is over. This Free Spin feature is very original and distinctive, for during the Free Falls, every winning symbol will earn you a marble which will then be used during the Bonus Game. A winning combination made up of 4 symbols, for example, will earn the player 4 marbles. Once the Free Spins are over, the Free Falls Bonus Game starts. After a change of scenery, the player finds himself in the bonus round, during which the marbles obtained during the Free Spins are thrown out of a spaceship. Those which fall in the orange Coin Win Cup grant the player coins. They may also grant access to the Jackpot game, however for this to occur the 3 marbles must fall in the red Jackpot Collector Cup in the middle of the screen. It may be played on smartphone, tablet or desktop. 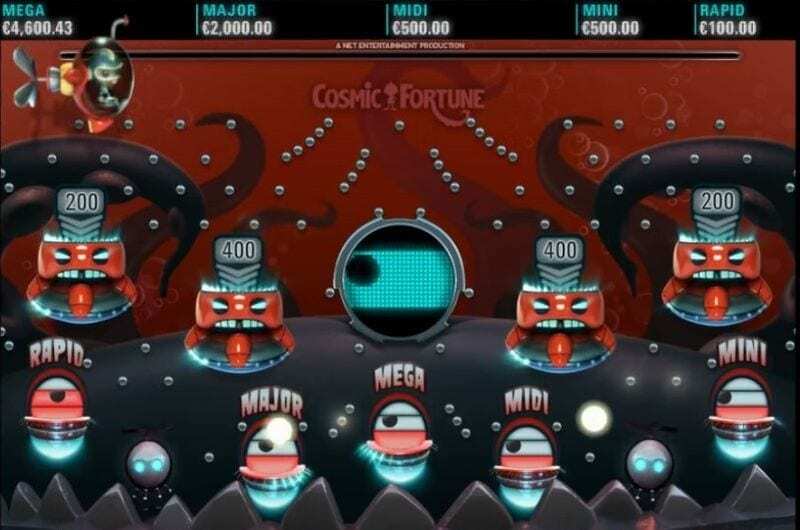 COSMIC FORTUNE™ is an online slot game full of surprises and is known for being the first machine developed by the slot provider NetEnt which puts at stake 5 jackpots: 2 fixed which amount to £100 and £500 and 3 progressive, including the mega jackpot, which can reach a value of £100,000. The 15 winning bet lines and the Avalanche™ Feature make the main game terribly exciting and enable players to hit big wins, yet what attracts gamblers is above all the special features, as they strive to hit a mega win thanks to the Jackpot Game! One may play this mobile slot on pc, tablet or on a mobile phone with a minimum bet of 15p and a max bet of £30. As regards the total hit frequency, it is very alluring, for it adds up to 40.50%! You need to know that those Jackpot are different per casino, this is why we speak in that case about local Jackpot.